The Florida Keys are a coral cay archipelago in southeast United States. They begin at the southeastern tip of the Florida peninsula, about 15 miles south of Miami, and extend in a gentle arc south-southwest and then westward to Key West, the westernmost of the inhabited islands, and on to the uninhabited Dry Tortugas. Our trip started in Key Largo, with a stop at John Pennekamp Coral Reef State Park, a Florida State Park located on Key Largo in Florida, and includes approximately 70 nautical square miles of adjacent Atlantic Ocean waters. It was the first underwater park in the United States. The park was added to the National Register of Historic Places on April 14, 1972. The park offers snorkeling and glass bottom tours of Molasses Reef daily. We checked into the Hampton Inn at Key Largo and went for dinner at Sundowners, an excellent place to watch the sunset and end the day. Day 2 drive started with a drive to Islamorada, a key 45 minutes from Key Largo, to find a local breakfast hangout called Bob’s Bunz. Their grilled cheese sandwich, the simplest of dishes tasted good even after a few hours. We then drove to Bahia Honda State park in the Bahia Honda key, one of the most scenic parks in the keys. Calusa and Sandspur are balmy beaches if you prefer to soak in the sun, or there are numerous trails including the trail to the incomplete Bahia Honda Rail bridge, originally built by Henry Flagler as part of the Overseas Railroad, completed in 1912 but was later destroyed by the 1935 hurricane and never repaired after. 20 minutes from the Bahia Honda State park is the National Key Deer Refuge located on Big Pine Key and No Name Key in the Florida Keys in Monroe County, Florida. The refuge is home to the endangered Key Deer, a subspecies of the White-tailed deer that is endemic to the Florida Keys and has a current population of around 800 animals. We saw 4. We drove into Key West, checked into the Inn at Key West, and end the day with dinner at Cafe Sole, an expensive but tasty food, french restaurant. 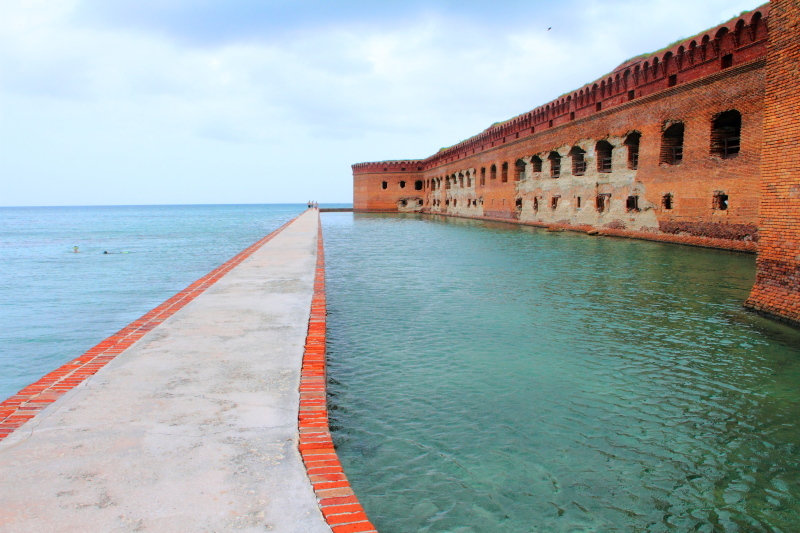 Day 3 was a trip to the Dry Tortugas National Park, (Click to see all photos from Dry Tortugas) 70 miles west of Key West, and one of the remotest National Parks in the US. We took the Yankee Freedom ferry, one of only 2 ways to get to the park. Back in the Key West in the evening, we got a chance to experience the night life in vibrant Key West. Mallory Square is where life converges after sunset and so did we. Day 4 started with breakfast at Croissants de France, oh the French and their croissants, and crepes!, and then a hop on, hop off tour of Key West. Sights included the Southernmost Point in continental U.S.A., Mile Marker 0 on US Route 1, the Hemingway home, where Nobel winner Ernest Hemingway spent 9 years married to Pauline and writing many of his books, the USCGC Ingham, one of the most decorated warships, now a museum, the Key West Butterfly and Nature Conservatory, one of the best we’ve seen, among many other sights. Lunch was grabbed from a Cuban sandwich shop, you must eat cuban food when in Key West, Cuba is closer than Miami, and then began a drive back to Miami. A stop over at Bahia Honda, to catch some more beach time, and eat our packed lunch and then made the slow, traffic-jammed drive back to Miami on a Sunday evening. Key West is only 3 hours from Miami and though usually a spring break or Halloween fantasy fest destination, is also perfect for a summer getaway.